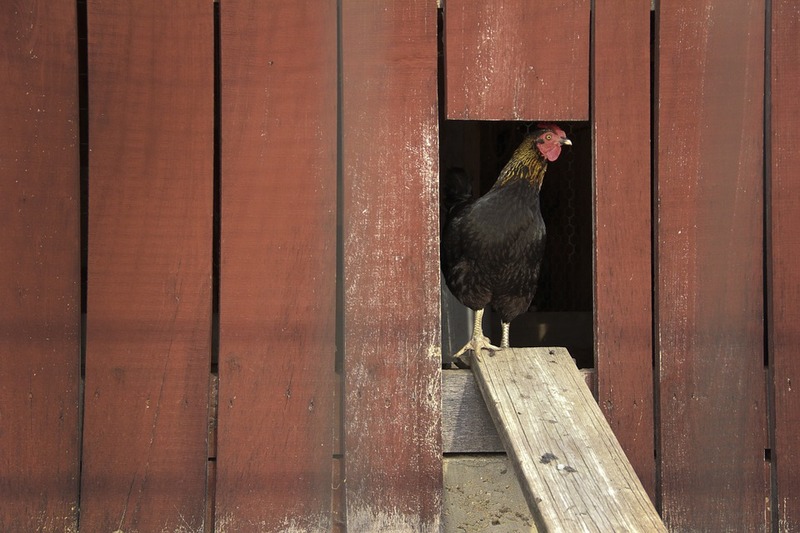 CHICKEN KEEPING: Free Range, Tractor, or Permanent Coop? (Which is best for your chickens)? When my hubby and I started our flock of eight birds two years ago, we were total greenhorns. Our heads were full of romantic ideas. Like how fun it would be to gather fresh eggs for breakfast each day. And to watch our pet chickens scratch around for worms in the lawn. Little did we know how crazy that first year of chicken keeping would be for us! (You can read all about it here). Without really considering the pros and cons, when our birds were old enough, we just turned them loose to start roaming our new farm. Free-ranging had it's pitfalls. We learned pretty quickly that freely roaming chickens leave freely scattered poop. (Nothing like stepping in a fresh pile on the doormat as you're bringing in the groceries)! The fact is, choosing how to house chickens is probably one of the most important decisions new chicken owners will make. It isn't easy. There's much to consider. That's why I'm excited to share with you the following guest-post by Liz Greene. It's packed with things to consider to help you choose what will work best for you. So, read on my friends! Free Range, Tractor, or Permanent Coop? How to house your new chickens? It's the decision every new chicken keeper must make. When it comes to housing your chickens, nothing is set in stone. Much depends on your specific situation — location, space available, weather patterns, etc. Some chicken keepers swear by their tractors, while others prefer to let their chickens roam free. If you’re trying to suss out what form of habitat will work best for your chickens, consider the following pros and cons. 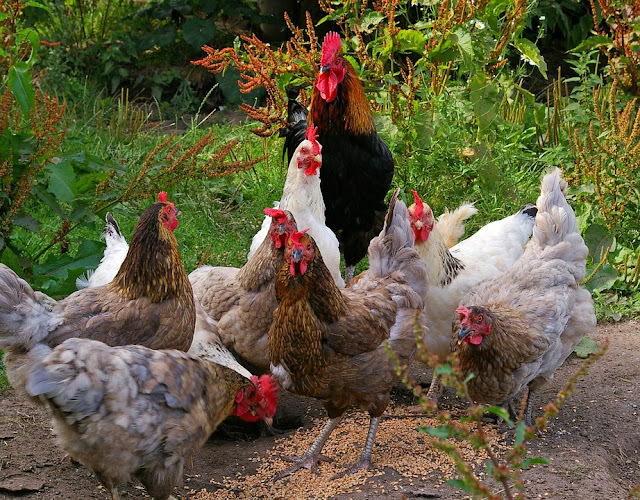 Free-ranging your birds has some great benefits, both to you and your flock. 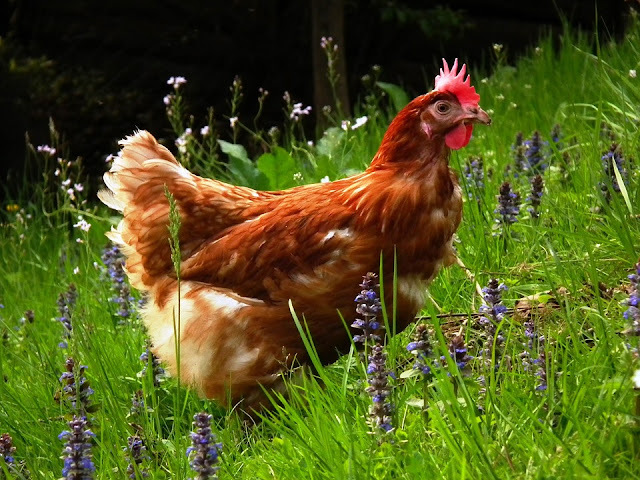 Roaming chickens search out much of their own food, such as insects (many of which are garden pests), berries, and greens. This can save you a considerable amount of money on commercial chicken feed. Additionally, when a chicken’s diet includes naturally foraged items, some of the nutrients are transferred to their eggs, and to you when you eat them! All this abundant food may seem concerning when it comes to your bird's fluffy figures, but worry not. Free ranging chickens are less likely to become overweight — the more room they have to wander, the more exercise they get. However, free ranging chickens can often get into trouble. If they’re allowed to freely scratch, they might end up doing so in places you don’t want — like your newly planted garden. And then there’s the poop. When chickens aren’t contained, neither are their droppings (so be prepared to ruin some shoes)! On the downside, if you have trouble with wild predators such as foxes, raccoons, or hawks, free ranging carries serious risk. In these cases, it’s best to confine your flock to a fenced-in yard. Just remember that fences won’t keep birds of prey from getting to your chickens. Even if you choose to free range, you will still need to provide an indoor space where your chickens can roost at night. Free-Range TIP: Poultry fencing is light-weight, easily moved from place to place and removes some of the challenges associated with free-ranging your birds. Find it HERE. A chicken tractor is a mobile, enclosed chicken coop that does not have a floor. They usually come equipped with closed-in sides at one end that include nesting boxes and roosts. Chicken tractors allow your birds to reap the benefits of foraging without giving them access to the garden or living spaces. Since tractors are moved daily, the chickens don’t overwork one piece of land. 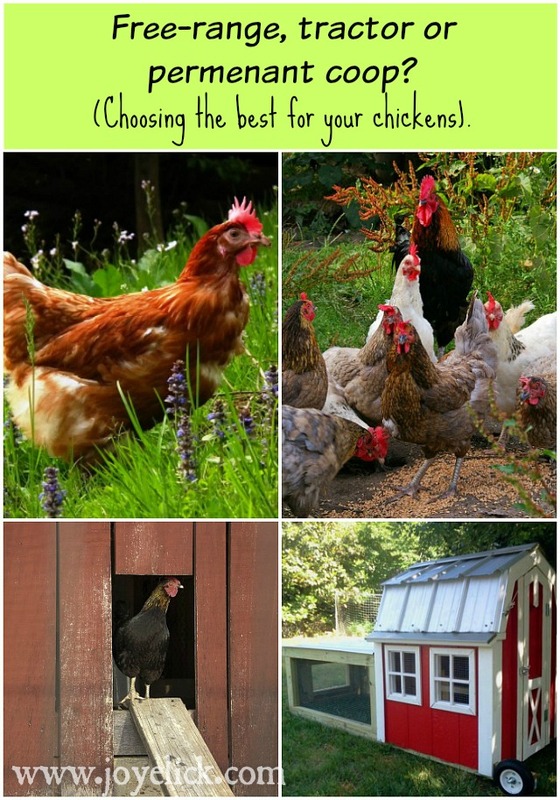 Plus, you never have to replace bedding or clean out the coop! As fantastic as tractors can be, they also have some downsides. In order to be mobile, chicken tractors must be small, and light. This means that there is only room for a few chickens. If you have a large flock, you’ll have to make another choice. In climates with cold and snowy winters, they can only be used seasonally, as there is no efficient way to keep them heated. Finally, although tractors are enclosed, they’re not completely predator proof. Raccoons in particular don’t find them to be much of a barrier. Tractor IDEA: Tractors can be simple. Light weight hutches like this one can be easily moved around the yard to give your birds fresh ground for scratching. Find it HERE. Permanent coops are small shed-like structures, often with a fenced-in run. You can build a chicken coop, or buy one pre made. The biggest advantage of a permanent coop is...it’s permanent. No matter what weather extremes you may face, the flock, nests, and roosts are safe from the elements. What’s more, you can plumb and wire permanent coops to provide heating, cooling, and running water. A securely built permanent coop is also nearly impervious to predators. Permanent coops come with their own unique disadvantages. Since chickens remain in the same area, any ground they have access to soon becomes bare dirt. The coop has to be cleaned at least a few times per year. All the old bedding and manure have to come out and be disposed of — a chore that is less than enjoyable. Finally, the coop itself can be expensive to build. Even if you buy one pre-built, they tend to be significantly higher priced than smaller, lighter chicken tractors. Permanent Coop TIP: If you don't have building experience, a pre-made coop can save you time and money in the long-run. It can be costly to round up tools and materials, if you're not sure what you're doing. Coops like this one, are affordable and designed with features that make it easy to clean. Find it HERE. Ultimately you have to consider what’s best for both you and your birds. Consider what predators inhabit your area, the climate, and how much maintenance you’re willing to handle. No matter what you choose, enjoy the time you spend with your chickens — they’re wonderful creatures. Let's chat: I hope you found this guest-post helpful! 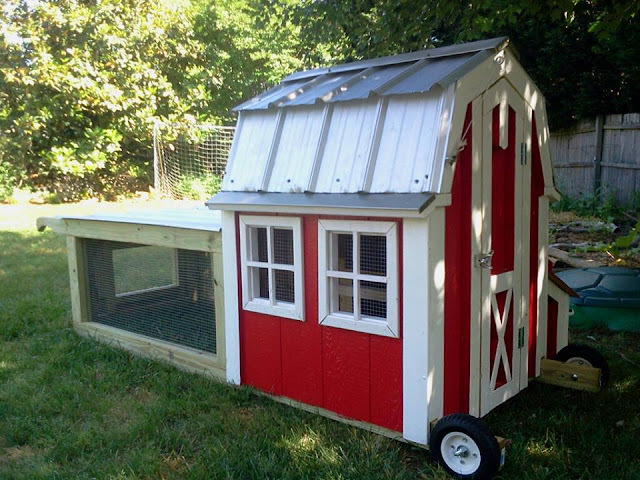 Do you have any added points you think should be considered when choosing how to house your chickens? I'd love to here from you in the comments below! How to train a rooster not to attack you. We had chickens when I was growing up and a coop. We would let them roam during the day and they would come in at night and we'd close them in until morning. I hope to have a small flock one day again. Great article for beginners. Thanks for sharing. Hi Marsha. Thanks for your comment! I hope you get your small flock. Chickens are fun to keep. Sister #5290. I think that looks good. That is a sort of a helpful experience for an ant farm, I guess. For me free range is the best way to keep my flock. They feel free and become more fertile. But I don't know which method to use during winter period. I've seen before that reviews on Trust my paper recommend to use permanent coop and keep stable temperature there. What do you think about this method? wonderful place for living..I love to live in farm like this. If you have the opportunity to buy chickens and keep them in your yard, be sure to do it and get organic products like eggs and meat. تنظيف الأسطح الصلبة: إنّ القيام بمسح الأسطح الصلبة باستخدام منشفة رطبة سيعمل على إزالة أكثر من 90% من حشرات المنزل.